The 'Great Composers of the 20th Century' series is a joint project between IMG Artists and EMI Classics. 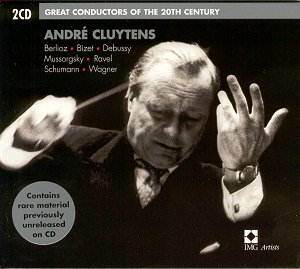 If the first issues are anything to go by, the enterprise is well worthwhile, and this two disc set of André Cluytens conducting various orchestras contains some real gems. Cluytens conducts a variety of orchestras with whom he was closely associated at the height of his career: the leading French ensembles, of course, in addition to the Philharmonia and the Berlin Philharmonic. The sound may differ markedly from one performance to the next, but is never less than satisfactory, and sometimes it is a good deal better than that. With the Philharmonia Orchestra in 1958 Cluytens conducted a vibrant interpretation of Ravel's La Valse, at London's Kingsway Hall. A noted conductor of this composer's music, his performance is brightly lit and particularly exciting, with some wonderfully expressive and supremely Gallic phrasing. The most recent of the recordings were made with the Orchestre de la Société des Concerts du Conservatoire, in 1963 and 1964. Debussy's three orchestral Images are wonderfully poised, within the context of a most pleasing acoustic and sound spectrum, recorded in the Salle Wagram, Paris. The Conservatoire Orchestra was at that time a major ensemble, associated with that organisation's prestigious concert promotions rather than a student group. Both here and in the live recording of Berlioz's Symphonie Fantastique, from Tokyo in 1964, there is the feeling of a special occasion, of artistry which brings a particularly keen focus on the music. There is an earlier, 1955 studio, recording of the Fantastique (Testament SBT1234), but this live version probably has the edge, being well recorded and particularly expressive. A couple of items from the German repertory represent Cluytens' interest in that sphere. We should not forget that he recorded a distinguished cycle of the Beethoven symphonies with the Berlin Philharmonic, which were for many years a staple of the Classics for Pleasure catalogue. That orchestra is briefly heard amongst this collection, in Schumann's Manfred Overture, and a very good performance it is too. The orchestral details are well illuminated, the textures delicately yet purposefully handled. And in Wagner's Act II Prelude from Lohengrin, although the orchestra is French (that of the Paris Opéra), the conception remains thoroughly idiomatic, even though the sound is less well structured than elsewhere in the set. There is a major operatic scene on offer, too. It features the remarkable voice of Boris Christoff as Mussorgsky's troubled hero in the Coronation Scene from Boris Godunov. Perhaps the added bell sounds which precede the music proper seem frankly 'over the top', but there is nothing wrong with the performance itself. Cluytens was an experienced hand in the opera house, and it shows, since everything feels absolutely in its right place, and the phrasing allows both the solo and the choral parts to make their mark. The collection opens with a delightfully pointed account of Bizet's Symphony in C, recorded as early as 1953, a few years before EMI's other famous interpretation with the same French Radio Orchestra, conducted by Sir Thomas Beecham. Cluytens is Beecham's match in this piece, although the recording is perhaps a little less sophisticated, being a little older and based on mono tapes. Whatever the details of the sound, however, the music is not compromised and the results remain pleasing, with some wonderfully elegant touches. The booklet contains a thoughtful and well researched essay by Robert Layton, outlining and evaluating both Cluytens' career and the choices of music gathered to form the set. For this is a most worthwhile collection of performances by a conductor whose musical achievement was considerable and will be fondly remembered by all who have encountered it.